Abstract: A nice example for numerical simulations of beam propagation in Q-switched Nd:YAG lasers shows that unexpected effects can be found with numerical simulations, but not so easily with analytical models or with experiments. However, you then need analytical reasoning to really understand what is going on. Laser modeling is often based on certain assumptions, which might not always be well fulfilled in practice. This is particularly the case for analytical models, which often require more assumptions in order to keep the problem manageable. 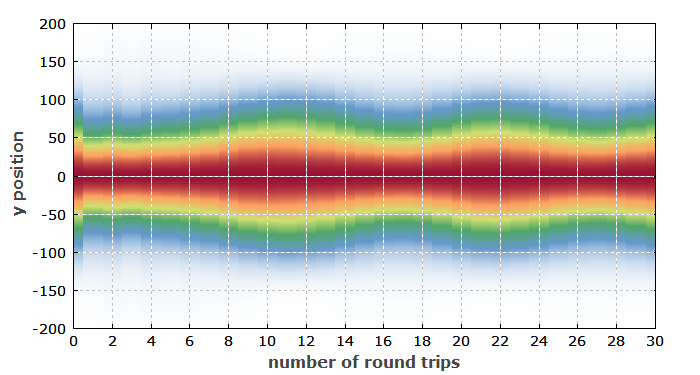 Purely numerical simulations are better in this respect. Here, I present a nice example for that. In simulations of laser performance, we often assume that we get a certain beam size – for example, the size of the fundamental resonator mode. For most bulk lasers with stable transverse single-mode operation, this is a well fulfilled assumption. I wondered, however, whether gain guiding in a Q-switched laser might have a significant effect. 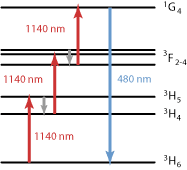 After all, the laser gain is often pretty high in such a laser, so that gain guiding might pull the beam size away from that of the fundamental mode – presumably to a smaller value. As strong gain saturation then sets in, the gain guiding effect changes during pulse formation, making things somewhat complicated. Figure 1: Evolution of output power and beam radius, the latter based on the second moment of the intensity distribution. The beam, starting with a Gaussian beam fitting the resonator mode (without gain guiding), quickly adapted to a somewhat smaller size due to the gain guiding. (Nevertheless, the second-moment-based beam radius actually gets somewhat larger due to wings of the profile.) 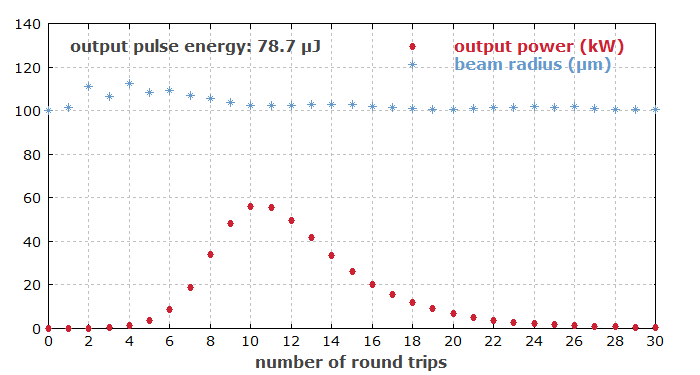 When the pulse maximum was reached after 13 resonator round-trips, the beam got larger and finally settled at a size close to the resonator mode size. Figure 3: Same as Figure 2, but with a spacing of 25 mm (instead of 20 mm) between crystal and end mirror. Note: the discrete steps are not the result of insufficient numerical resolution, but of significant changes in beam size during a single resonator round-trip. One can see that now the beam shrinks substantially during the pulse build-up, and later evolves into a kind of donut shape. Although that shape is rather pronounced, it would be difficult to detect experimentally, as that requires a time-resolved measurement. (The temporarily integrated beam profile, weighted with the optical power, does not show much – just a certain deviation from a Gaussian beam profile.) If one would put a photodiode at different portions of the beam, one would find different temporal pulse shapes and durations. Apparently, the laser resonator is substantially more sensitive to the gain guiding effect for that particular resonator length – but why is that? The explanation is far from obvious. 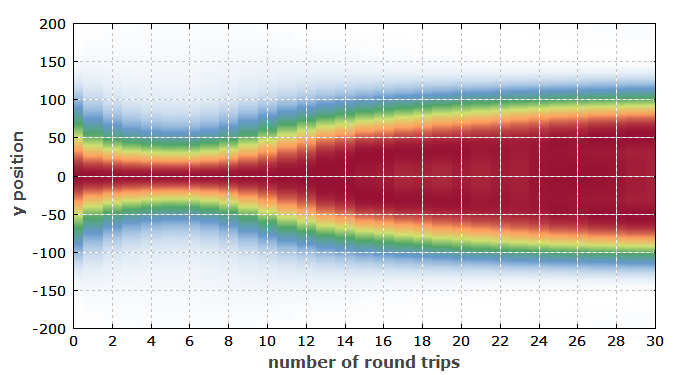 A resonator design analysis (done with the RP Resonator software) shows that just for 25 mm air gap size, the Gouy phase shift of the resonator per round trip becomes 1.59 rad, which is close to π/2 (= 1.57 rad). A consequence of that is that the TEM40 and TEM22 modes have resonance frequencies which coincide with resonances of the TEM00 fundamental mode. At this point, some resonant mode coupling can occur, which has a strong impact on the beam profiles (see R. Paschotta, “Beam quality deterioration of lasers caused by intracavity beam distortions”, Opt. Express 14 (13), 6069 (2006)). 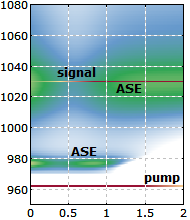 This example shows that substantial effects, which might impact performance and also applications of the laser beam, could easily stay hidden with analytical simulations, requiring assumptions such as a constant beam size. Moreover, even in experiments one would probably not recognize what is going on – maybe only that the performance is not quite as good as expected. It would then be very hard to find out what's the matter. By the way, I wouldn't say that the numerical approach is always better – ideally, you are able to use both approaches. In our example case, numerical modeling brings up interesting details, but only analytical considerations (see the cited paper) can well explain them. You can read a more comprehensive description of the model and some technical details on the page with the detailed case study for the Q-switched laser.